First off, The Sun is reporting that AC Milan are contesting Chelsea for the signature of Alexandre Pato from Internacional. Pato's agent, Gilmar Veloz has suggested that any move cannot be completed until the player has reached the age of eighteen, thereby ruling out any chances of the player moving until January next year. 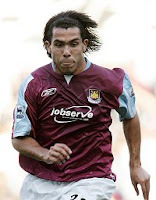 The Sun is also claiming that Carlos Tevez would be open to a move to Arsenal to replace Thierry Henry. He is quoted as saying "I know people are now talking about Arsenal and obviously that is something I am excited about. It’s another big club and the good thing is I wouldn’t have to move out of London. I also already know English football and I like it". However, Spanish newspaper Marca (Spanish link) is reporting that Tevez, whilst flattered by interest from Arsenal and Real Madrid, has his heart set on a move to Italian side Inter Milan. With West Ham owner Eggert Magnusson recently stating that he expects Tevez to stay at the club next season, it will be interesting to see how this transfer tug of war develops. Another ongoing transfer saga is that of Tevez's compatriot, Javier Saviola. It seemed Middlesborough were in pole position for his signature, but now Lionel Messi is saying in Marca (Spanish link) that he will be sad to see Saviola in the shirt of Real Madrid next season. One transfer that has finally been concluded is that of Honduran forward David Suazo, who has completed his move from Cagliari to Inter Milan today. Sky Sports is reporting that he will be presented to the Italian media as an Inter player tomorrow. Sao Paulo's Brazilian defender Alex Silva has received offers to join various European clubs, though to be from the German and Italian leagues, according to RBSclic (Portugese link). Having seen his first team opportunities limited this season, it seems Silva is going to use a clause in his contract to instigate a move to Europe for next season. RBSclic (Portugese link) also report that Brazilian Thiago Motta is to leave FC Barcelona following their signing of Yaya Toure. There is no word yet of any interested parties, but I would expect to see many Spanish and Portugese teams interested in signing the versatile midfielder. Greek club Olympiakos seem to be going Argentine crazy at the moment, having made a £2.4million offer for Deportivo's defender Fabio Coloccini according to Sky Sports. Coloccini seems destined to leave Depor over the summer, but having already turned down offers from clubs in Qatar and Russia, it will be interesting to see his reaction to this latest interest in his signature. Finally, Sky Sports reports that Scottish club Gretna have confirmed the signing of Fabian Yantorno on a one year deal from Urguayan club Miramer Misiones, beating off competition from sides in Uruguay and Mexico for his signature.